The pst file extension is associated with applications developed by Ulead like PhotoImpact photo editing software for Microsoft Windows operating system. The pst file stores pattern image. The Ulead was acquired by Corel. 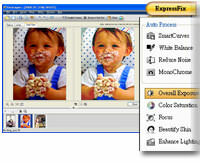 PhotoImpact X3 is photo editor and photo manager for Microsoft Windows. It is able to edit various picture file formats as well as RAW photo images. Ulead was later acquired by Corel and PhotoImpact was discontinued. Use XnView to view content of *.pst image files. XnView is able to export *.pst files to other formats. Programs supporting the exension pst on the main platforms Windows, Mac, Linux or mobile. Click on the link to get more information about listed programs for view pst file action.